Last weekend, Julie and I went to ComicCon. This was the second time I'd gone to a comic book convention, but the first one was much smaller. We went for a couple hours on Sunday, so we only experienced a slice of it, but that was more than enough. Someone gave her free tickets, so we went. Obviously, she went as Tony Stark and I went as Captain America. It was a lot of fun, despite the incredible burden it was for Julie. She spent the day walking around a bustling convention hall, which was a hell of a way to get back into walking now that she has her walking boot. While eating lunch, a stranger was gushing about what a great Drunk Tony Stark costume she had. She chuckled and sighed and explained that it had just been a regular Tony Stark costume when she'd left the house. Julie met Eric Powell, the creator and writer of The Goon. If you haven't heard of it, the Goon is an incredible, funny, and original comic that is really worth buying. If you have heard of it you're probably freaking out the way that Julie did in front of Eric Powell's publishing partner or sister, or whoever was manning his both while Julie waited for Eric Powell to walk back from the bathroom or wherever he was. Unsurprisingly, he was really nice. We also saw a statue of Captain America that was unveiled at ComicCon before being permanently placed in Sunset Park in Brooklyn. This made me happy. Growing up, my mom always loved Superman. For decades, Superman has existed as much outside the comic book as in. To normal people who have no familiarity or interest in his zany comic book adventures (which are, by and large, TERRIBLE, actually), they just know the character as an embodiment of hope and other virtues we all assume to be universal. A lot of that is just because of the one and a half good Superman movies Richard Donner made nearly 40 years ago. But that's all it takes. The character's recent appearances in Man of Steel and Batman v. Superman seem to have altered Superman's identity more than the character's long absence in film. Zak Snyder's 'modern' take on the character is... detached. Brutal. Impulsive. Reckless. Sadly, he seems more like a reflection of how America is than how it has always aspired to be. I confess that I share my mother's silly affection for such a flat, boring character. I like having a figurehead for American can-do-ism. I think we all benefit from having such a pure and non-partisan shorthand for integrity/perseverance/restraint/etc. So I'm glad that through four great movies and one good one, Captain America (as played by Chris Evans) seems to be stepping into a similar role for this generation. At least to me. This is all a great shock to me, by the way. I remember at Penn State when my roommate Pat announced that he was going to make a Captain America costume for Halloween. At the time, I couldn't figure out if I was more confused by the question of 'How?' or 'Why?'. As far as I was concerned, the character didn't really make sense (does he run around looking for crimes? What does he DO? ), and his costume was as tacky as it was impossible to adapt into the physical world. Seven years later, it was with reluctance that I agreed to dress up as Captain America when a big group of us decided to dress up for The Avengers. When we decided to dress up again for Civil War, I was much less reluctant, and I was extremely proud of the costume I put together. 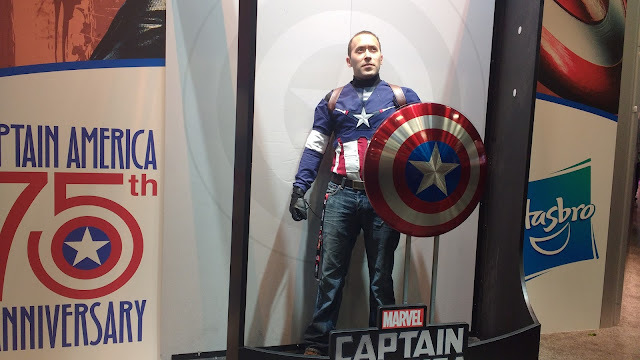 By the time I went to ComicCon, I couldn't deny that I was stoked to cosplay Cap. I even took a picture of myself posing in front of the statue and then decided to leave it out because it didn't look nearly as cool as I'd hoped. My costume didn't get too much attention. Honestly, I noticed more people geeking out of Julie's Tony Stark cosplay. I did notice, however, a stark difference in demographics. Whereas the attention paid to Tony Stark was from fans and groupies, the people who wanted to take a picture with me were kids. They really liked holding the shield. Though I'm still embarrassed to admit it... that makes me glad. You may want to click through by clicking the imgur logo in the upper right. Imgur is changing the way they embed things, so vertical photos are cut off. If you see more bugs than this, please let me know at andrew@shrad.org.